Over 300 years ago, vervet monkeys were brought into the island of St. Kitts from West Africa. Some where along the line they acquired a taste for alcohol by eating the fermented sugar cane left in the fields. 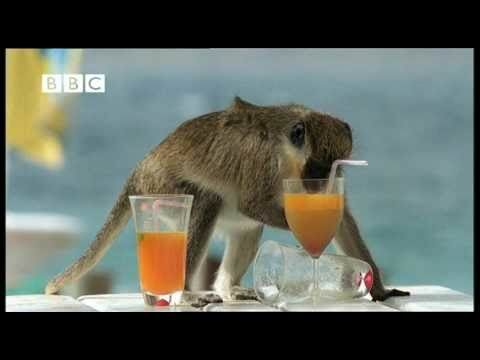 Today, the monkeys hang around the beach and steal left over drinks from the locals. It's hilarious to see these monkeys go up and sip on drinks. I've never seen anything like it! Get a glimpse of these monkeys by clicking on the link below. Enjoy! Now this is an adorable sight to see! Little critters enjoying a big feast!